Ticket Prices The Diamondbacks employ dynamic pricing, based on demand. $15-$70. Directions From Loop 101 (Pima Freeway) northbound: Take exit 44 (Indian Bend Road) and turn left, proceeding west for approximately 0.6 miles. Turn right at North Pima Road. The ballpark will be located on your right. From Loop 101 (Pima Freeway) southbound: Take exit 43 (Via De Ventura) and turn right, proceeding west for approximately 0.8 miles. Turn left at North Pima Road. The ballpark will be located on your left. Audio broadcasts on 98.7 FM, KHOV 105.1, ESPN Phoenix 620, and MLB.com. Televised games on Fox Sports Arizona and Fox Sports Arizona +. This is a final Arizona Diamondbacks 2019 spring training schedule. The team is one of the top draws in all of spring training, so keeping track of games at Salt River Fields is a must for any spring training traveler. We expect an Arizona Diamondbacks 2019 spring training schedule to be posted before Thanksgiving. 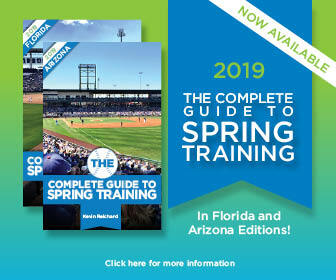 To receive Arizona Diamondbacks 2019 spring training schedule updates and other spring-training information via email, please sign up for the Spring Training Online email newsletter.